MEET THE GUY BEHIND THE MAGAZINE SELLING TRAVEL IN A WORLD GONE SLIGHTLY MAD! THE O&M – The page for bricks & mortar Managers. THE FRONTLINE – The page for Travel Counsellors. THE EDGE – The page for Home Based Agents. LOGO’S FOR YOU & HOW NOT TO DO IT VIDEOS THE EXTREME BDM – Helping BDMs help you! USING USTREAM.TV – Broadcast “live” anytime. STEVE GILLICK ‐ Guest Article by Steve Gillick, CTM. SELLING IN A WORLD GONE SLIGHTLY MAD! TRAVEL WRITING – The write way to sell travel. THE “OH FUD! FACE – How to handle it. MANGA MANAGEMENT – Business Toon‐Ups for all! THE GUY BEHIND THE MAG – Short intro. PRODUCTS & SERVICES – SMP support resources. BACKPAGE COMMENT – Something to leave with you. THE NEXT GENERATION OF TRAVEL AGENT WILL USE ALL THE TOOLS AND SELL TO ANYONE FROM ANYWHERE. This travel agent is slightly different from the travel agent you know and love and have hired in the past. For the most part you have not yet lived through the ups and downs of the travel trade with this Ng TA and to create a relationship that works ‐ you will have to learn their ways. She will be a 20 something new kid on the block and she may be someone who does business in a way you do not understand. You will need to be trained in virtual staff management and coaching because the Ng Agent is mobile and can think, tell and sell as she travels about town or travels the world. She will not settle for less than a high 5 figure income. Read the following in one breath as that’s how fast this business is going to get. Super hi-speed cloud based selling is coming to an agent near you. Hire them soon! This new travel agent, the Ng TA will be super savvy when it comes to using technology, she will be wired into everything, maintain a mobile office, a virtual presence and a business format that uses the Cloud for all accounting, filing and general backroom systems. She will be able to book anything to anywhere from anywhere. She will communicate with her clients who share the same techno travel lifestyle through all forms of social media. She will sell visually via her own iPhone App that she created called Me. She will offer her personal ring tone to her clients who will know, when they hear that sound, that it’s time to travel. She will know which hotels offer large screen TV’s, high speed everything, laptops, iPads and the comforts that Ng Travellers want and need. She will engage her clients with barcode marketing schemes. She will upload her Me travel videos to keep her customers visually connected and informed via her branded personal channel on YouTube. She will talk on camera to describe what she is looking at right now and invite her customers to fly‐in for the week to share the experience. Back home she will meet in a coffee shop or anywhere with a white wall and with her palm sized projector show her recent travels to a small group of clients. She will connect to ViVu via Skype and talk to 100 customers via live video feed. She will transmit live from her ocean view room using uStream. Her customers can get her latest newsfeeds, blogs, newsletters with one click. She will build her business through Facebook, Tweeted and reTweeted referrals. She is LinkedIn to her corporate accounts, frequent travellers and high end vacationers. She understands the value of viral and always creates the book‐now buzz that her clients are happy to forward. Why? Because she is exciting! She reads quality online magazines and continues her education gaining trade and speciality certifications and designations. She supports various trade associations and is a stickler for human rights, staying green and protecting the planet – her main source of revenue. She is Ng TA – your next hire! Your next partner. Your next home based / mobile agent. Your next New Business Generator. And guess what? I write a monthly sales column for CT and feature articles on how to sell destinations – PLUS I get to deliver the CT Webinars that are FREE to YOU every last Thursday of each month! All this and pages of top quality destination information too. Read CT and check for webinars Here. How’s that window real estate working for you? Do you have a plan that will generate a decent ROI? Believe it or not your window must be factored into your marketing plan. It can actually stand it’s own marketing plan if you’ve a mind to write one. Here’s the deal. That glass is costing you. You can I am sure work out the cost as a percentage of your rent but that’s w‐a‐a‐a‐a‐a‐y over the top for this idea. Just tag it as very expensive marketing real estate if it’s idling all day long with nothing behind the glass to attract the walk‐by potential. 1. If you have one of those closed signs hanging on your window, throw it away. Travel agencies never close – however they do open again in the morning. 2. Make sure your website is listed on the glass too. Make your agency window a glass act! The FRONTLINE! Where it all happens. Where the sales are made. Where the excitement is. Where the fire breathing customer from hell usually stops to chat! Oh boy! Wouldn’t this one fry your day! It’s not that they mean to be mean it’s just that they are and no one has yet put the flames out! That’s not your job, dowsing the flames however, for your own sake you might have to step up and take care of the agency’s reputation and in a cool, calm way ‐ take care of business. How you do that will depend on how crisp you want to be when the conversation is over! Naturally you will have corporate guidelines to go by. The handling of fire breathing clients is usually a topic found in the Agency Operations Manual. It’s easily identified by the scorched cover and it’s usually found hanging next to the fire extinguisher! Here’s a few tips on putting out these flamers. Just changing to the more calming blue text colour to complete this page. Well you have to realize that most operations manuals, when it comes to handling irate, fire breathing clients are not written by anyone who has actually met the dragon head on and doused the flames. No. Usually the verbiage comes from a book, a business consultant, the agency accountant or the local plant shop owner! None of it works in real time. Here’s the nut. The fiery client is unhappy. Could be the job, the spouse, the kids, life in general, last night’s date ‐ or they were just born this way to quote Gaga. A few things are obviously happening and nothing to do with you unless it is your fault. Perhaps you asked when she was expecting and she isn’t. You greeted him as “Miss…” when he isn’t. You mentioned a senior’s tour and then find out your client is 26! OR… you actually fouled up the arrangements. OR #2… it was another agent in the agency who started this file and has since legged it up the road to the pub. Whatever the situation – it’s your mission as of now. As the saying goes, “It’s not your fault, but it is your problem”. This is followed by the words “Deal with it!” So let’s do that. Let’s give you a few ways to handle this situation, turn it around and make sure this customer wants to come back and do it again – the flameless version that is. First things first. Not everyone leads a charmed life. Each one of us has something chewing on us at some point in our lives. So, go with that and work your magic with a few words and phrases that either calm this client down – or meet the flames head on. There are many schools of thought about how to work with an unhappy customer and they range from taking it on both cheeks to standing up to the fiery person and just givin’ er! The latter not bring highly recommended. Generally, those that have weathered such storms, now considered abuse, the best thing to do, if you can and if you are trained to do it, is to remain focused, interested and allow the person to get “it” off their chest. Now in the heat of the battle, you don’t turn to your computer and start whacking the keyboard and you don’t let your eyes do the talking, because eyes do have a great way of projecting what you are really thinking. Everything you’ll read from here on takes practice. These are not one‐read‐how‐to solutions that you can do or deliver with any sort of flair unless you put your time in. The Hand Oh yes, raising the hand signalling the client to stop. Gutsy, and it must be delivered with the right phrasing, eye contact, smile and genuine concern for the client who just lost it. 1. The raising of the hand is slight, the hand is open, friendly yet controlling. 2. At the time you have shifted in your chair to be ‘bigger’ claiming and controlling your space. 3. The words you say now flow like this: “Ms. (Name) let me jump in here and help you (do not mention or acknowledge the customer’s outburst – no need to give it any power) I think I have a way to sort this out and it won’t take long.” Now it’s time for you to take back the conversation, “Two questions for you…” You’ll need to ask two or three questions because a) you need more info’ and b) this puts the customer in a different mindset and away from the regurgitation and repetitive comments. 4. It you detect the client’s body slump a little, or they lean back in their chair with a slight sigh you know they have reconsidered their behaviour. You have them tracking in the right direction. Now you simply nod your head towards them as you stand up and say, “Coffee, water or pop?” You’ve just changed the playing field once more. The customer now has to think of something else other then his or her problem. If they decline, you can say, “Come on, let’s have one together as we work this out…” You can see how this approach will gently lower the heat and allow the customer to regain composure. Above all else, never let your customer lose face. Now lead the customer to the outcome you have in mind. Get your own group there bucko! This one’s mine! Do you feel that sometimes you’re just not taken seriously? By the trade I mean. If that’s happening to you, here’s how you can take on the big guys! I’ve been independent and home based for well over 17 years. I know what makes my business tick, I know my strengths and if I’m down a quart here or there on knowledge I top up. Pretty simple stuff really isn’t it? If you are new to selling travel and come from another industry / career then you’ll be on a steep learning curve. I can tell you from my 45 years in the trade that you have entered what has to be the best business in the entire world. But that’s because travel is in my body and soul. If you’ve come to dabble… well your chances of success are between zero and nada. That holds true for any industry doesn’t it. You can’t dabble at being an accountant, and you can’t dabble at being a lawyer. No use dabbling at being a commercial airline pilot for obvious reasons and dabbling as a brain surgeon… well that’s a no brainer! So why is it the travel industry attracts and allows dabblers to join? It seems like an easy thing to do I guess. The home based travel agent that shares my own dedication to the travel industry will have a long and worthy career. It’s this EDGE that suppliers and your peers in the trade are looking for. That and a ton of sales! Now despite many home based agents selling world cruises and building huge FIT groups and establishing a niche for themselves, still there are some naysayers ready to cut your landing gear off. What to do? Try these ideas to start: 1. When you appear to the trade and to the public make sure it’s first class, top notch, one‐hundred percent. I’m talking: 1. How you look, dress etc. 2. Your website layout, colour scheme and content. 3. Your Facebook wall. 4. How you Twitter. 5. E‐mail content and attachments. 6. How you explain, present and articulate an idea. 2. Forget asking for a FAM if you haven’t sold anything. 3. Make sure your business cards are printed on quality stock – leave the perforated DIY stock to the dabblers. 4. Do have a business email not a hotmail email… come on! 5. Your website is the center of your marketing universe. Templated websites are fine… but fill it out, complete it, every page. Remove old stuff. 6. Buy the software you need versus borrowing from a pal. Make sure you are operating with the best tools for marketing. 7. Get behind your hosts marketing, events, group departures and forget trying to reinvent the wheel. 8. Attend all training offered by your host. 9. Learn how to use communication tools like Skype, Ustream, webinar systems and expand your ‘hood to the world wide hood! 10. Create a business plan each year and invite the BDMs of your preferred suppliers to meet with you and help you build that plan. I’m looking for real‐time challenges that stop you from being the best you can be. Be sure to include your email and website links. Thanks! Every month you can find a new cut & paste logo on the SMP website, just for you. Although the one shown here can be used by any travel agent – a home based agent could use it to great effect. SHARPENING THAT EDGE One of the transitions in the trade is travel industry veterans, Owners, Managers and TCs are choosing the home‐based lifestyle. For owners they are tired of paying rent and dealing with HR challenges. How nice to take the best customers and head home to work in peace and generate the income you need and want. Many of these veterans will have their CTC, ACC, MCC and Specialty designations (of which there are more than 30) plus their history of travel to market. If you are a home‐based agent and new to the trade then you should follow the people that carved out the industry and 1) Start studying, pass the exams and claim your designations. 2) Start travelling… like yesterday. Build that first hand experience and do not wait on the suppliers – pay your own way using agent discounts – and get out there see the world. You will have a lot of competition. Some with 30 years in the trade, 60+ countries, tens of cruises and a data base of ‘everything’. Sharpen that edge sooner than later and you will do very well. Congrats if you’ve just joined. On this page we enhance the sales relationship between supplier BDMs and the travel agent. Outcome: faster, quicker, larger, higher revenue sales! What’s YOUR repYOUtation? We all know the sales rep’s position has changed in so many ways. Many of you do not have an office, you work from home, your car, your laptop and we also know that you look after anywhere from 100 to 250 agency accounts! Not only that, we appreciate the fact that you need EXTREME dedication to the job and the brand or brands you represent. You’re up and out on the road, heading to a conference, delivering a presentation for a shy agency owner and making sure your revenue is where management says it should be. AND SOME PEOPLE THINK A BDM’S JOB IS EASY! One of the key challenges for a BDM in the current world of pushing product to travel agents is credibility. Next is follow through. Then there’s maintaining your reputation which has become your REP‐YOU‐TATION! Yes, it really is all about YOU. Nice eh? Planning the Agency Plan Here’s where you as a BDM can help build your sales and those of your accounts. It means blocking time with the owner of each agency on your list and helping them plot and plan how they will factor your brand into their selling year. What you’ll need to take to the table will include latest trends and ideas for selling your products, current and upcoming promotions, incentives for additional sales, in‐agency training dates or a personal webinar. You get the picture. By helping the agency owner with their strategic plan, you can show them how, use real data to support the plan and then establish a marketing activity chart that both you and the agency owner can monitor. The ability to write a strategic plan is not a skill every BDM has. If you want to build your rep‐YOU‐tation to the Extreme level… learn now and help your accounts grow your sales. BROADCAST LIVE TO YOUR CLIENTS, PROSPECTS, SUSPECTS AND ANYONE ELSE OUT THERE WHO MIGHT WANT TO TUNE IN. Welcome to USTREAM! Now this is a find if you have not yet found it! I'm assuming you are an out going travel agent, gregarious, and someone who loves to be on camera and who can conjure up an audience in your mind as you chat to the wall! All you need to make this idea happen is a webcam and mic. A good one mind you. No cheapie stuff. In the screen area would be you. Yes that's your stage and screen. What you see here is your dashboard. The customer will only see your screen, plus a few ads from Ustream's other clients. You can remove the ads by going Pro. Your choice. So let's talk about those wine tours to France I mentioned on the P3 page. Now you can actually beam out to a dedicated audience who will sign in with a password to watch your show, or you'll go public. Worldwide if you wish. So now imagine this and this is pure NBG! New Business Generation. You are going to email your clients with the link to your show. You can ride the big wave and let the entire world join in and watch your show. You can get busy and sell a supplier some air time on your show. You can chat up the wineries and sell them air time too. Do you like this? You must. It's Next Generation in terms of marketing your brand. Click to www.ustream.tv Check it out. Go LIVE! Note: Make sure you check what your audience will be looking at behind you. Remove any junkie stuff. No jock or girlie posters. Nothing crooked. Nothing from the dark side! Have a screen behind you like I do and all will be well. The end result is a time‐perfect tour where everyone has their scheduled free time, everyone is safe, everyone has seen what the brochure tells them they would see and everyone contributes to the tip for the driver and guide on the last day after the ubiquitous final, farewell dinner. Indeed, in referring to the classic movie of tour guiding, “If it’s Tuesday it must be Belgium”. But this is a bit of an anachronism. The hamster‐wheel travellers of the past—and the tour companies of the past—are morphing into specializations and niche markets and celebrating the individualism of the traveller. Good‐Bye Hamster Wheel…hello Global Zorber! hamster wheel. They do what they are them to look, take photos where the photographer) tells them about a has more to do with the proximity of guide gets a kick‐back). Hamster depend on the tour company for every compliant the traveller, the less chance on the tour. Watch your watch, go recommend and, yes I will provide you feel your independence from the guide. If you aren’t in the same mind‐frame then you may be on your own wheel, watching your Global Zorbers take off without buying your travel services and expertise. Global Zorbers (GZs) are a different crowd altogether. They may take a package tour that allows them to see a number of sites and includes accommodation and some meals, all from a budget and time efficiency point of view. But Global Zorbers can see the whole picture of travel (the gestalt) and even more important, they can see what the destination does for them. Whether it is photography or shopping or culinary experimentation or collecting wines or clothing (etc) the GZ can mentally rise above the structure of the tour and realize his/her own interests. 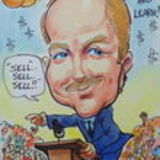 Travel well – then tell and sell! have not done before or for that matter, no one in their circle of family or friends has done before. Zorbing is understanding, acknowledging and getting jiggy with different cultures, people, languages, food, ecology, history and everything that the big picture of travel to a destination covers. But what of the symbolic plastic orb in which the Zorber resides as he/she bounces across the globe? This is merely a transparent bubble and not a protective shield, When you interact with the world with transparency and a genuine outlook on life then ‘the world’ tends to reciprocate in the same fashion. Zorbing is a way of looking at travelling the world with a fresh exhilaration. The feeling has been described as electrifying, energizing and euphoric. Nike, captured the spirit of Zorbing with their tag line “Just do it” and their next generation tag line “Impossible is nothing”. The hamster wheel is a rusty relic of the past. Your clients are absorbing themselves in the joys of travel. Basic marketing 101 starts off with the instruction to “know thy audiences and how they behave”. Successful travel professionals will go out of their way to master this skill. SELLING IN A WORLD GONE SLIGHTLY MAD! THE P3 METHOD OF MAD WORLD SELLING The other day I wanted to find out how much of our world was still in good shape to receive a tourist or two. You know what I'm talking about. Wars and climatic situations that can cause a customer to pause. Well I got quite a surprise. There ain't too many places left to go ‐ well that's what it looks like, feels like, sounds like when you watch the six‐o‐clock news on TV. Here's the magic bullet however and no fun or pun intended... when things go bad 'over there', the tourist will head in the opposite direction. So, to sell travel in a world gone slightly mad... you need a P3 and that would be The Power of Three. The POWER of THREE is what you could call a New Business Generator's mantra. It is also one of the best forms of business continuation concepts to factor into your staying alive plan. It's simple. P3 means you have three variations of whatever it is that generates your core business. Let's say you have developed, or you want to develop a niche. That niche is something like golf, skiing, adventure, wine & food, cruise and religious tours ‐ or any one of the more than 300 niche markets that exist today. I'll go for the wine tours. If you devoted your entire wine tour program to let's say France, then if that one country is hit by anything that would cause a customer to pause ‐ then you could be sucking wind on those once lucrative and expected sales. Enter your P3 Plan. Following this formula you would have wine tours in France as always, plus, Australia (waaay the other side of the pond) and where else, okay, California. Now you're cookin'. Now let the world turn, and try to do damage to your wine tours. No chance, because you have cleverly arranged similar tours in two other locations, continents apart so that when push comes to shove you might even be able to switch your Europe bound customers to enjoy one of the two supporting destinations. You can apply the P3 concept to any type of niche travel holiday. For instance you can offer three ski destinations, more than three wedding destinations ‐ and if you favour all inclusives in the Caribbean ‐ always have another island or two up your sleeve. You can also offer three different niche holidays in one location. Should one niche fall out of favour then you have two others. The sister career to travel and one more way to generate new business for your agency and YOU! Travel writing, as in writing about YOUR travels, can be one more way to generate new business for your agency and given all the online applications and gadgets, software and how‐to‐write websites it’s not such a difficult hill to climb. So if you have always wanted to write that book that everyone seems to have inside them… why not start with writing about your travels. This idea can work for both bricks & mortar agents and home‐based. Of course home‐based agents can be quicker on the mouse with this, as they do not have a manager to please. For B&M agents always, always check first and do that by asking your manager if it’s okay to write and use the agency as your claim to fame. This is very important. Obviously you want everyone rooting for you and not wondering what you are up to. So let’s say you have the go‐ahead. Excellent. Here’s how it all works. What you are going to do is this. You are going to attract new customers and sell your existing customers to call you – all done through your writing skills. I say writing skills. It’s not that easy to write… you may have to take lessons. For some it might come naturally. Assuming you are bursting with talent. Now the questions pop up: What do you write about? How do you let everyone know what you have written? Why will they call? Let’s go back to square one. You are a travel agent of some record. You work for a brand named company or well known local agency. All of this is good. This is the credibility, backing and support you need. Your readers will identify with the brands. So now it’s all about YOU! Where have you been, what have you done, how well can you tell it, and then can you sell it? Some people have been to 20 countries. Others have notched up 50, 65, over 100. How do you compare? How many cruises have you cruised on? Miles flown? Miles hiked? Mountains climbed? You get the picture. You’ll need to build that bio so that it almost sells the article before anyone knows it’s coming. If you do not have all this travel experience to draw on and write about, you can still write about destinations and draw on the stories that most suppliers have ready and waiting for you to embellish. Let’s jump ahead now. You have your articles written. Don’t waste time trying to find a magazine to print them. Upload your articles to your website. Think up a good name for this web page. Perhaps start a blog and post your article there. How about saving your article as a PDF and attaching it to emails – or just send the link to your webpage where your clients can find it, open, read it, forward it to their friends. When you travel, you can also upload your articles to your blog. You can Tweet out a message when the next page is up. You can write “When I get home I’ll be putting on a presentation for you (your clients) – you will love it here!” You’ll need to start reeling in your readers, building momentum and then let them in on all your secrets once they are seated in front of you. Obviously there’s much more to writing than this. I just wanted to plant the seed. So now you are a travel agent and a travel writer. Travel writers also receive invitations to attend media trips. Many require that you will be able to publish your articles within 3 months. Well, if your agency has a client / readership of say 1,000 then this will work for you. If your agency has a membership of several thousand – then you are away to the races! Writing about your travels can generate more interest, more inquiries and more New Business than you can handle. What to do when you get the "OH FUD!" face As you can see in the image here, dear ole customer is having an "OH FUD!" moment which translates into "fear, uncertainty and doubt!" The "Oh FUD!" face can happen at anytime. When you advise a customer the cost of their trip, perhaps when you suggest they protect their family and purchase travel insurance ‐ also, when you decide to ask your manager for a raise! That "OH FUD!" face will most definitely be yours if they refuse! Yes the FUD face happens to everyone. The FUD face response means 'here is an opportunity' ‐ which is what some people would call an objection. I don't deal in objections ‐ I'm strictly for the opportunity. It's how I roll and how you should too. FUD faces happen when a client just needs more information. Somewhere during the sales process they missed something. No problem. No hassles. Just look into that FUD face, tilt your head to the side and eyeball your customer and simply say... "Your face is telling me you need more information..." Then you ask yourself, "What did I miss?" From that moment on, as you well know, you remain quiet, look at your customer and let the FUD simmer and settle... your customer will respond when ready. The key here is to not allow your customer to back out of stating their need for more info. If they leave without being fully informed it could come back to haunt you. “Why didn’t you tell me that BEFORE!” Keep the concept of the FUD face in mind as you go about your business day and when you see a FUD face in action that's not related to you, perhaps in a department store when a customer is engaged with a salesperson... make sure you hang around that counter and witness how the sales process evolves. As an aspiring New Business Generator, you must maintain an opportunity mindset at all times. Every interaction is just one more opportunity. Keep that top of mind each day, every day. It’s important to keep notes on how you and your colleagues handle “The FUD FACE!” situation when it arrives at your desk. Learn what works in your agency and make sure everyone practices how to quickly resolve these interactions. Hi! Yes I'll own up. It's me. Known as the idea generator by a few, I started the NBG model, the new business generation method of looking for opportunities for selling travel - and pretty much that search for new ideas has filled my travel trade career that now spans... well it’s clocking about 45 years at this very moment!! I do love the outdoors. Did then, and still do today. a new pair of hiking boots back in 1960'ish and again in 2011 – nothing's changed!! Still a wild and karazy kind a guy! I have owned and operated my own travel agencies, worked front line and managed agencies for companies such as Thomas Cook, Atlas, Uniglobe and before I stepped off the corporate ladder to go solo, I had been a VP Western Canada and Director of Business Development for Uniglobe and General Managed a tourism training school. Over the years I have opened corporate travel departments, cruise desks, led groups, consulted worldwide ‐ and all sorts of things you do on the journey from there to here. I started in the trade when I was 16 or so, travelled around the world by the age of 19, and to date have managed to visit 45 some countries. Yeah I know, pretty wimpy after so long in the trade! But hey... someone had to stay back and manage the agency! Yes, if you want to travel in the trade, stay frontline or go home‐based! Okay that's enough. If you want more bio, head over to my website and read me there. There’s a short and long version (yawn!). 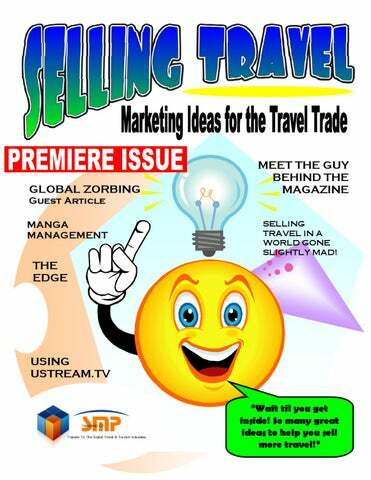 Hope you enjoyed the first issue of SELLING TRAVEL. It’s not perfect. It will get better. The main thing is to pass on NBG ideas to you so you can GNB – Generate NEW Business! LOOKING FORWARD TO YOUR COMMENTS! CONFERENCE KEYNOTES Fast paced, humourous, excellent imagery and delivered with in street‐savvy, no‐fluff and little theory format. Click 4 More. WEBINARS & WORKSHOPS Webinar’s are an SMP specialty. Running 75 to 90 minutes, they include a workbook plus 30 minutes for post webinar time with me AND a 5‐day review of the webinar recording for additional note taking. Click here for details. PUBLICATIONS The ultimate desk reference for TAs. With 412 pages, covering 273 marketing ideas + 700 links to additional information. Order today from Big Bark Graphics – Enter the Big Bark Store here. Now a available in e‐Book format. E‐mail for details. And that brings us to… right about here! I hope you have enjoyed the first issue of SELLING TRAVEL and at least picked up one idea to try and I’m anticipating an email to say you did indeed make a sale. Helping you generate NEW business is the intent behind the content in SELLING TRAVEL. You won’t find destination reports or hotel reviews here. There are plenty of magazines like CT that deliver on those topics. But when you want a creative nudge come back to SELLING TRAVEL and of course always visit my website at SMP TRAINING.com I would love to have your feedback and constructive criticism on and about anything that helps move the magazine forward in terms of delivering content that will help grow your sales. Send me your own ideas that have worked for you – especially if you have generated sales through your social networking activities. TELL A TRAVEL AGENT COLLEAGUE, HEAD OFFICE, YOUR SALES MANAGER OR YOUR HOST AGENCY ABOUT SELLING TRAVEL MAGAZINE AND LETS WORK TOGETHER TO BUILD THE SELLING TRAVEL COMMUNITY. No-fluff marketing ideas for travel agents and travel trade suppliers.